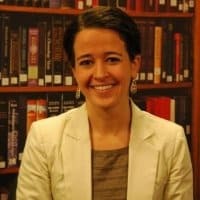 Heather Esper is Senior Program Manager for the Performance Measurement and Improvement team at the William Davidson Institute at the University of Michigan (WDI). At WDI she leads the Performance Measurement Initiative, which specializes in designing and implementing customized measurement solutions to assess the economic, social, and environmental performance and outcomes of organizations and businesses operating in emerging economies. At WDI she works to create more value for these organizations by using this data to improve their effectiveness, scalability and sustainability. Esper co-developed a versatile tool and methodology with a multidimensional view of poverty that is used by ventures to assess their poverty alleviation outcomes. She has worked with numerous businesses, social enterprises, nonprofits, government institutes, and foundations across sectors in Africa, Asia and Latin America to identify, measure and analyze their impacts and develop strategies to better meet the needs of their stakeholders. Esper holds a Master’s of Public Health and Bachelor’s of Science in Global Health from the University of Michigan. She can be followed on Twitter via @heatheresper. We live in an era of multi-sector solutions. But it's easy to forget that diverse sectors working closely toward big global development goals is a recent phenomenon that didn’t happen by chance. At a talk at the William Davidson Institute, Tami Kesselman, founder of Aligned Investing Global, discussed several key tipping points that have allowed the business, government, philanthropic and impact investing communities to overcome misaligned priorities and mistrust. Check out her interview and her predictions on what will come next in multi-sector development. For many businesses and organizations, the idea of measuring their impact can be scary, elusive or just plain boring. But pairing social and business metrics "power couples" can give organizations unique insights to solve key business challenges. In a new report, the William Davidson Institute shares the results of its work with three organizations to demystify data collection of their social impacts. Rebecca Baylor of WDI writes that the team's work proves impact measurement doesn't have to be as hard as it may seem. Recent debate has focused on whether businesses should assess social, economic and/or environmental impact. How did we get stuck here? In this two-part series, Heather Esper and Yaquta Kanchwala Fatehi of the William Davidson Institute explore the evolution of assessment and how to move beyond the paralysis. Heather Esper and Yaquta Kanchwala Fatehi of the William Davidson Institute say it's time to stop debating whether businesses should assess social, economic and/or environmental impact, and move on to a conversation about how to extract the most value. They even offer five core activities to accelerate that value. Measurement is an iterative process. Metrics can and should shift as a company evolves from design to scale. Organizations should focus on collecting data that helps them improve their operations, such as data that can lead to them creating more value for their customers, producers and/or the communities where they operate. Housing and sanitation: Perhaps no two sectors have greater potential for substantial impact on the many complex problems facing humanity – if their solutions are scaled. And just how to do that, and to know you’re doing it through metrics tools, was an ongoing theme at SOCAP14. Many BoP ventures struggle to capture a complete picture of what is going on inside their organization. WDI’s Heather Esper on a new webinar series focused on how to how ventures can understand how their actions are truly influencing poverty. So, you want to learn more about your impact, or about the preferences of your customers at the BoP. It’s time for you to run a household-level survey. But how do you get started? Part 2 of our Measure for Measure series lays out eight things to keep in mind when developing survey content and processes for impact assessment.